Users / Re: Airplayer device as Audio for a room? Oh I see airplayer provides a destination for other non-Linuxmce devices...? Turns out the cheap devices (soundmate M1) run openwrt, I just have to get squeezeslave and alsa compiled for them. Cheers, yeah it would be a good future feature, but after watching the weather temperature demo (very well explained), its out of my league. Users / Airplayer device as Audio for a room? Hi, The summary of what I cant work out is to be able to use a physical airplay compatible device to stream audio/music for a room, that can be controlled from an orbiter. I read a while ago that it should be possible because of the way the airplay plugin works - data goes to the DCE and gets directed to the airplay devices (scripts) on the MDs. So I figured create a faux "AirPlay Audio Player" and put in the IP and/or Mac of the physical device. I see that I can only create them under Orbiters, which the room doesn't have. Before I go any further am I wasting my time and completely wrong all together? Can I perhaps use the "AirPlay Audio Player" template as a base for what I want? 1GB RAM, 1GHZ CPU and 1Gb NIC would help with some performance issues. I believe it's compatible, just more expensive. With the sata port you could almost use it as a core. Formated MD's the drive to ext4 and it was detected fine. I did notice the fresh install of 12.04 it didn't pickup my software raid as it did in 10.04 and 8. I didn't think anything of it because that's what I wanted. Come to think of it, it also didn't prompt to use the HDD's in my MD's either. Again not an issue for me, because I'm not using them. Users / Re: Can I control a DLNA device (SONY TV) from Linuxmce? Hi, I have purchased some RGB LED lights which can be controlled using a central controller that accepts basic UDP network packets to make it change. They are also sold under the mi-light and easybulb brand names - although I believe they use slightly different commands depending on version. I have tried a few different things and was wandering where I was going wrong? The icon to turn them on/off appear in the orbiters but they dont react to the orbiters. I also believe they don't report status (on/off, etc..) they only accept commands. Users / Re: Is anyone using the Game Player? If room has security cameras and temperature probes run this: /usr/bin/wget –delete-after “http://192.168.80.1:8888/$CAMERANUMBER/config/set?text_left=$ROOMNAME – $TEMPERATURE"
Users / Re: Pluto_media over 5,5GB? No sure about everyone else but I use the drive for backups and other files, and to stop it checking those folders I use %.folderlock files so it skips checking them; eg: "Backups.folderlock"
I had a quick look before to see if anyone else has this issue; I have 2 USB webcams setup but when viewing the live feed on the windows orbiters the screen often locks up or often the screen does not present an image (I don't mean the grey one that has a time stamp). Other than that issue the webcams work fine for recording. 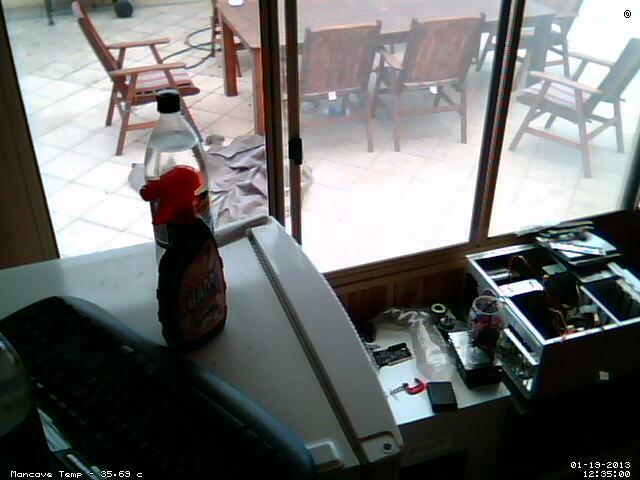 I can view the webcams through the web interfaces for each for as long as I want and they work fine. Using Linuxmce 10.04 and has been happening for a while. Developers / Re: lmce-admin redesign ? Just a little thing, wizards are good for the first time or two through a system. After that they are an excise and an annoyance. 1. One Android app on my phone that allows me to use everything that Linuxmce has to offer securely and remotely (latency permitting). Eg; view security footage, Make a SIP call, view files, etc.. Possibly like a background service? 2. I would also like to have a complete live backup option; 1 that backups up root, data/media, and the database to a baremetal recovery without having to turn it off and have down time while it pushes data over the network/external drive. 3. qOrbiters on MD's please.